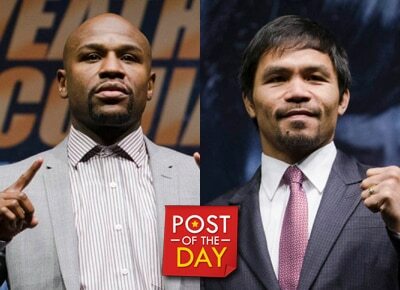 Will there be a Mayweather-Pacquiao fight part 2? World boxing champ Manny Pacquiao teased fans when he showed his customized coat with an interior of himself throwing a right hand punch on the right side and Floyd Mayweather Jr. on the left side on his social media accounts. “Like my jacket?” he wrote in the photo’s caption. Netizens are thinking that the senator may be hinting about another May-Pac fight in the future. Pacquiao lost to Mayweather via a unanimous decision last May 2015 and the latter has not fought since defeating Andre Berto in September 2015. Pacquiao on the other hand recently beat American Jessie Vargas in Las Vegas, Nevada last November 6.